Character Counts - Now You Can Get it Instantly! Plunge into adventure instantly by choosing from over 60 pre-generated first level HARP characters. Each character is game ready, with good stats, balanced skills, a training package, and talents. Attack bonuses, defensive bonuses and skill bonuses are all figures, Just pick a character, choose a name and start adventuring. We've even included equipment bundles for characters to choose from, so there are no worries about facing the monsters unprepared. Over 20 new training packages add interest and vitality to the characters. These packages give your character a past and a future - be an Explorer, a Vagabond, a Mercenary, a Lightbringer or a Dwarven Defender. Players interested in the Martial Arts, can choose from several new training packages including "The School of the Mouse", a martial arts style designed for short people. 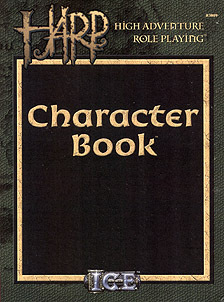 The HARP Character Book is ideal for beginning and experienced gamers who want to get into a HARP game quickly without going through the character creation process. The book is perfect for new campaigns. Just ask the players to choose their characters from the Character Book for an interesting, weel balanced group of characters in a hurry.